For many years Biola University, in partnership with Saddleback Church in Lake Forest, Calif. through Rick Warren’s PEACE Plan, has sent nursing students to Rwanda to serve and minister to the healing nation. Twenty-three Biola nursing students who have either traveled or are planning to travel to Rwanda were among 250 special guests of the President of Rwanda at Saddleback’s Civil Forum on Friday, Sept. 25. Thousands of people were in attendance to hear Rwandan President Paul Kagame and Miroslav Volf, Henry B. Wright professor of theology at Yale Divinty School and director of the Yale Center for Faith & Culture, speak on reconciliation. Biola’s Nursing Director, Susan Elliott and Professor of Nursing, Glenn Styffe, along with 13 current nursing students and 10 nursing alumni attended the event as special guests to President Kagame because of their ongoing service in Rwanda. “When His Excellency, President Kagame of Rwanda stood surrounded by Biola students, faculty and staff, I felt overwhelming pride that we would have such access to one of the great leaders of our time, but I also felt overwhelming humility and a sense of destiny...aware of the stewardship God wants from us...to use this opportunity to bring Him glory,” said Styffe. Since 2006, Biola’s Department of Nursing has taken a handful of students to a country that is rebuilding itself after the massive genocide in the mid ‘90s. Only three months ago, Biola students, Elliott and Styffe were working in Rwandan hospitals, so meeting and hearing from the leader of the nation they served over the summer was a significant experience for them. “When I saw the students surrounded by Secret Service and The President of Rwanda, my mind goes to the little rural hospital I know they were in–a hospital with nothing in it...and I see the student touching the life of a lady who is dying alone... having the President of Rwanda here impacted me greatly–Because I see God’s greatness working at Biola, through the students, in partnership with the local church,” said Styffe. Biola alumnus, David Stevahm (’09), who went to Rwanda in 2008 and 2009, was excited to reunite with his Rwanda team members for this special occasion. At the forum, President Kagame explained his candidacy for presidency, his transition in becoming president and his strategy for reconciliation in his country. His message gave Biola students perspective and hope as they remembered their time in Rwanda. “Each of us who has been to Rwanda has had first hand time for reflection at several genocide memorials. Each has looked at walls of photos of the dead, skulls, and mass graves. Each has been in the marketplace, church and hospital wondering ‘am I sitting next to a killer or a survivor,’ ” said Elliott. 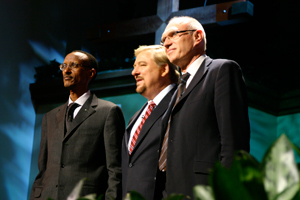 Moderator, Rick Warren, senior pastor of Saddleback Church praised Kagame for his leadership in a country where some would seek revenge, but Kagame has moved towards peace. “The reason we saw reconciliation on a national level is because this man [Kagame] treated the enemy with dignity,” said Warren. 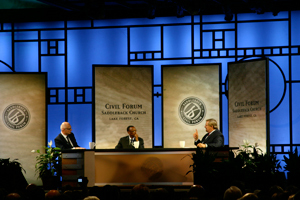 Warren honored Kagame with the 2009 International Medal of Peace. Kagame thanked him for his support and everyone in the audience who have served in Rwanda. “You are part of the story of Rwanda and the success, so I want to say you are part of this recognition too,” said Kagame. Elliott was moved by the many nursing students in attendance and the opportunity to attend the forum. 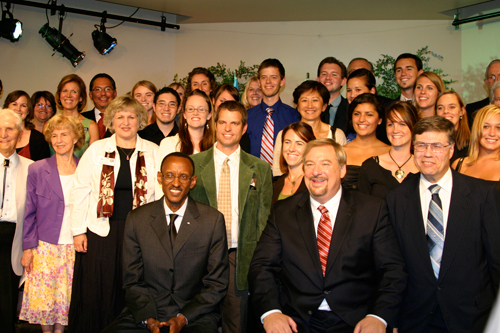 Biola continues to send students to Rwanda, including another group traveling in January 2010. “God is using the students of Biola to impact individual lives, God is using them on an individual level, but also at the level of the global stage. They are impacting a country. To connect with the greatness of someone like His Excellency...to give an encouraging word, to represent the Christians who are building His country—it inspires me to get ready for our next trip [January 2010],” said Styffe. Written by Brenda Velasco, Manager of Internal Communications and Public Relations. For more information, contact Jenna Bartlo, Media Relations Coordinator, at (562)777-4061 or through email at jenna.l.bartlo@biola.edu. Reading about these humble servants of The Lord makes me so very proud to be a Biola alumnus. How wonderful to see the nurses' participating outside the US. I am an alumnus of Biola and a nurse who served 2 missionary terms in Uganda. This was an awesome experience. Kudos for the nurses and Biola for supporting their service.